← Wednesday, August 15, 2012: McMenamins Lodge, near Portland. Stop Three of this wonderful excursion, hosted by the Washington County Visitors Association, was dinner: a seven-course Winemakers Dinner at the 1910 Main: An American Bistro in Forest Grove. As you might guess from the logo, the bistro’s fresh ingredients come directly from local farmers and fishmongers. 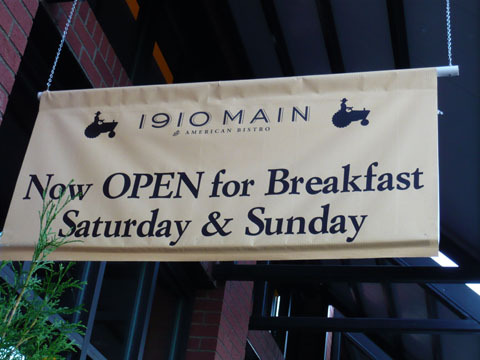 Owner and Chef Kathy Compton created 1910 Main after 30 years of catering and restaurant experience, working as the Chef for Montinore Estate, and running the tasting rooms for numerous wineries. As a wine blogger, I nearly always taste, enjoy, and review wines naked—naked as in the wines without food, not me sans clothing! That said, with several years of restaurant reviews in my background, if someone puts food in front of me with the wine and suggests it’s a decent pairing, I’m all for it. 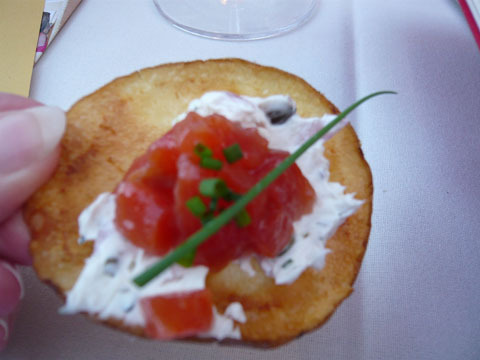 The Aperitif, gin-cured Oregon Coho salmon tartare on a crisp and robust potato slice with a spread of Boursin-style goat cheese, was paired with the 2011 Apolloni Sparkling Rosé. This reminded me of the traditional Italian-style opener—upon entering an Italian dining establishment, one is often handed something to eat and a glass of bubbly, usually Prosecco, and in fact first-generation American Alfredo Apolloni comes from an Italian family of winemakers for more than a century. Chuck Wagner (Caymus) is Alfredo’s assistant/consulting winemaker. The winery names many of their wines after people in the family, and this one is dubbed Laurine, for Alfredo’s wife, who was present at our dinner. She described this wine as “the Pacific Northwest’s twist on Prosecco,” made in the Charmont style. This rosé of Pinot Noir had a beautiful strawberry nose, and was quite dry yet fruit forward. Fermented in stainless steel, it also yielded watermelon and a mild grapefruit finish. $15, RECOMMENDED. 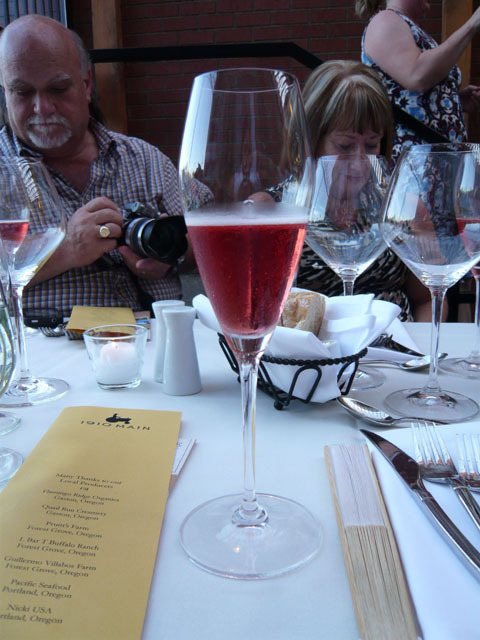 Pictured: Apolloni rosé with people in the background: Tom Plant, wine travel and tours, and Linda Kissam, publicist, travel writer. 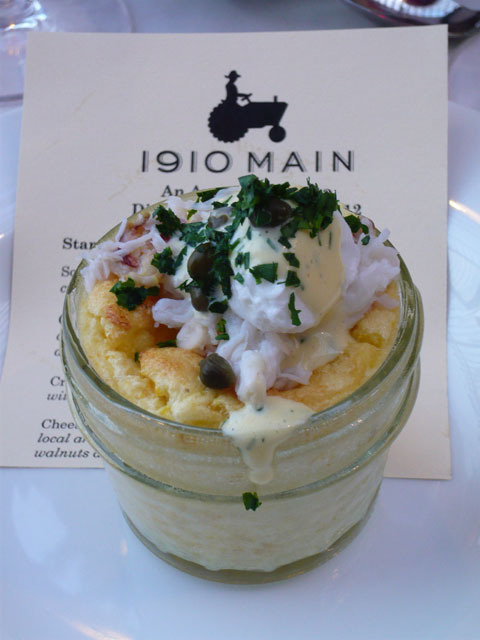 First Course: Pruitt’s Farm fresh corn spoonbread with Oregon Dungeness crab and poached quail egg. Paired with 2011 Cooper Mountain Pinot Gris, and 2009 Anam Cara Cellars Nicholas Estate Pinot Noir. Cooper Mountain’s Barbara Gross is the second-generation winemaker. She told us 123 acres of fruit were planted in 1978, in 1995 they were certified organic and in 1999 were certified biodynamic. Priced at a modest $15, this is typical of the independent Oregon wines: so many of them, especially the whites, are ridiculously affordable. Willamette is indeed a wine lover’s paradise. Pinot Gris (aka Pinot Grigio) is Oregon’s second most prolific grape grown, after Pinot Noir. Pale straw, melon nose, expands in the mouth, peach cobbler, slightly sweet yet refreshingly tart, warms and opens to spice at the back of the tongue; soft, almond note. DELICIOUS. 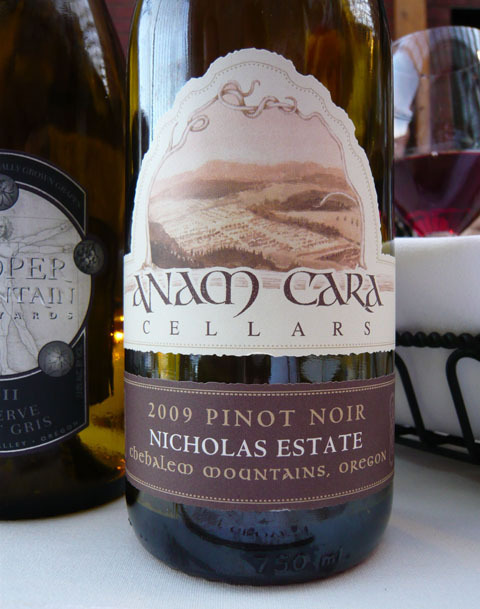 ABOVE AND BELOW: The 2009 Anam Cara Cellars Nicholas Estate Pinot Noir, Chehalem Mountains, was just delicious. Sheila and Nick planted 10 years ago, and all their wines are estate grown. Fewer than 1,000 cases were made of this wine, yet it is priced at $32, a bargain for an artisanal Pinot. This beautiful wine had a ruby center with light brown 3/4-inch in, and clear edges. Cedar on the nose, strawberries and a smooth, luscious mouthfeel. Tannins hardly evident at all: soft and gentle. HIGHLY RECOMMENDED. 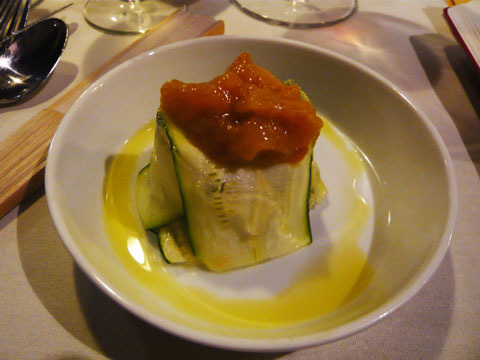 Course Three: Pruitt’s Farm zucchini terrine with Farmers Market peach conserve. Paired with 2010 Cooper Mountain Chardonnay (old vine), $30, earthy with a kiss of oak; and 2009 Ponzi Chardonnay Reserve ($30, round, rich, fruity, kiss of oak, melon, layered, balanced, outstanding). Both of these wines were made from Clone 108 (Wente) grapes. 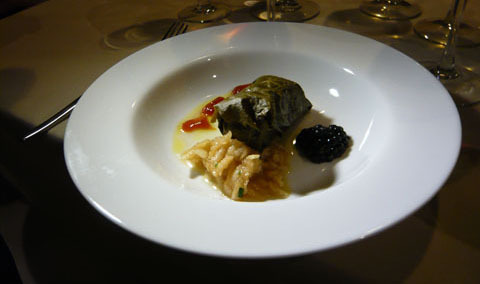 Course Four: Duck-stuffed Plum Hill Vineyards Pinot Noir grape leaves, with Gravenstein apple slaw (above). 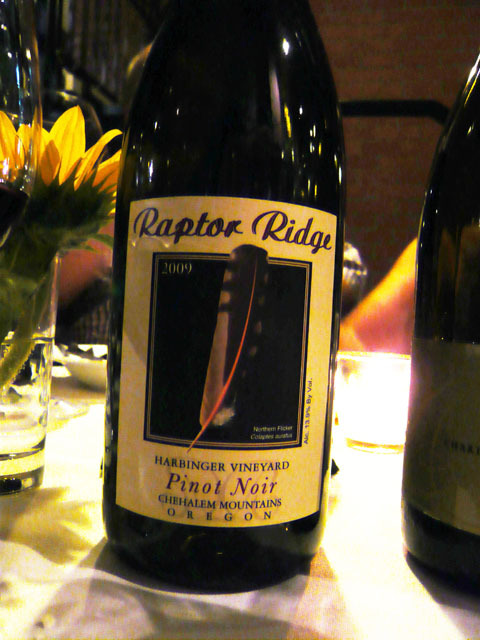 Paired with 2009 Garden Vineyards Pinot Noir Reserve (plum, rust, cranberry), and 2009 Raptor Ridge Harbinger Pinot Noir (tasted closed at first, but opened beautifully with big fruits, $38), pictured below. Course Five: Washington Kumamoto oyster with Flamingo Ridge tomato sorbet. Sorry, no pictures. 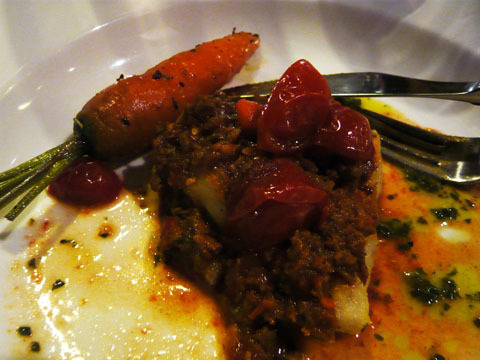 Course Six: L Bar T buffalo Bolognaise with gnocchi and poached petite tomatoes. Paired with 2009 Apolloni Soleggio and 2009 Ponzi Pinot Noir Reserve. 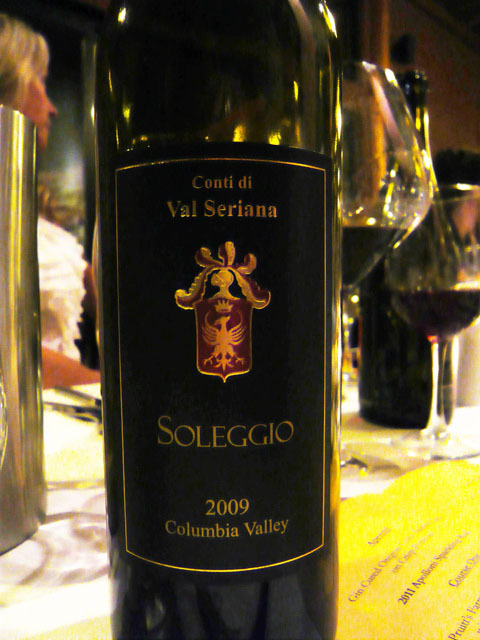 Soleggio, which means “sunshine” in Italian, represents the sunshine-ripened grapes, which make up this Super Tuscan style blend of Sangiovese (bright fruit), Cabernet Sauvignon (structure), and Merlot (balance). Molasses, brown sugar, pipe tobacco, caramel, cedar, plum, tannins; stood up to the gamey, earthy, savory meat dish very well. Maria Ponzi, second-generation winemaker serving as Director of Sales and Marketing at Ponzi, explained that their Pinot Noir Reserve was grown on older vines planted 1975-1985, and she described the laurelwood soil, deep roots, salt soil base, gravity-flow irrigation, and other details. 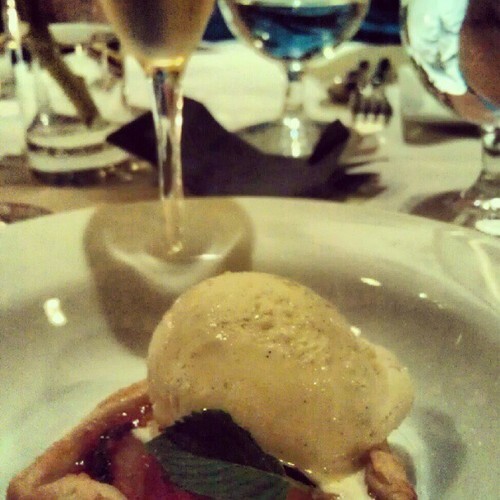 Anam Cara Dessert Gewürtztraminer. Just delicious: lychee and honey, $24. Photo by Leilani Carrara, Wine Deviant blog. This was a fabulous evening with delicious food, wonderful wines, and wonderful company including some gifted winemakers and wine writers. Salut! This entry was posted in Oregon, Restaurants, Tastings, Travel. Bookmark the permalink. 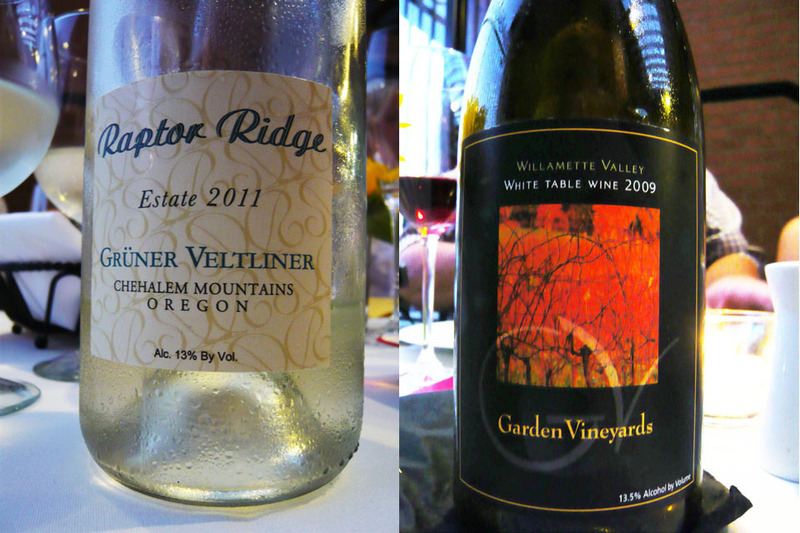 One Response to Seven-course winemakers dinner, 1910 Main, Forest Grove, Willamette Valley, OR. Exquisite … the photos, the written imagery and the information! It looks as though you and the other bloggers must have been treated as very special indeed. Kudos.